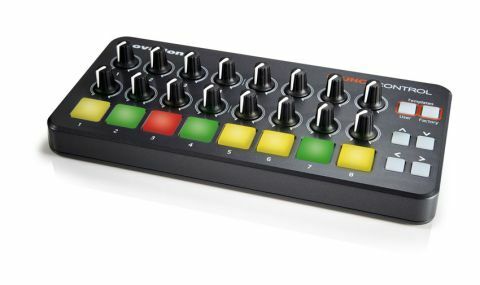 Novation's Mini range makes it possible to have 'real' controllers you can use everywhere you go. As portable as you'd hope - you can take it anywhere! Typical Novation build and support - it doesn't feel like a toy. iOS and Linux compatibility for maximum versatility. Hard to fault, given the price and versatile functionality. Novation has been busy, expanding its controller range (Launchkeys), updating previous models (Launchpad S), releasing new hardware synths (MiniNova), and reissuing old favourites (Bass Station II). Now it's targeting laptop/iOS users with a new range of scaled-down hardware: the Launchpad Mini, the Launchkey Mini, and the all-new Launch Control. "If this was just about the smaller designs, that would be interesting enough, up to a point, but it's also about compatibility"
If this was just about the smaller designs, that would be interesting enough, up to a point, but it's also about compatibility. These devices are buss-powered from computer or iPad, and also compatible with Windows, OS X, and Linux. A suite of controllers that are truly portable between your studio and mobile devices is pretty tantalising. You can never have too many knobs in your studio, and the Launch Control is a cheap and compact way to add 16 more, along with eight pads. The pads aren't velocity sensitive, but they're still backlit with those three-colour RGB LEDs. Eight factory and eight user banks provide many times more control per square inch of surface area. In terms of build quality the Launch Control doesn't feel particularly delicate, and it's not as teeny as you might think. Novation has made set-up as straightforward as possible, whether you're using it with the free iOS apps, or with Ableton Live, Logic Pro, and FL Studio, or any other DAW, on the computer. There are no drivers to install, and there are starter templates for Live, FL Studio, and Reason to download. Up to a point, instant control is available, and beyond that you can create your own custom MIDI assignments and save them in the user presets on the Launch Control. We began with Live on OS X. After configuration in Live's Preferences, the device had immediate control over Live, with three separate templates, covering more detailed mixer functions, sends, clip launching, and device control. With user presets as well, the Control made a great little controller for Live. There's also a dedicated on-screen editor, which adds further flexibility. "The Control is a perfect companion for Logic Pro X's Smart Controls"
The Control is a perfect companion for Logic Pro X's Smart Controls - 12 on-screen knobs that take over the currently selected device. Logic remembers MIDI assignments across projects, so you only need to set this up once. One thing that could be confusing is the pads. The pads on Launch Control's sister model, the Launchkey, are velocity sensitive, but the Control's aren't. It's not a huge problem either way, but something to ponder when choosing. Also the Launchkey and the Launchpad Mini use mini-USB to connect, while the Launch Control uses full-size USB. To connect to an iPad, you need Apple's Camera Connection Kit. The iPad will happily power a single Mini; you can use a mains powered USB hub to connect two at once. Of course, the Control will also function with other MIDI apps, but using it with the Novation apps is a no-brainer. The experience is very smooth and the Novation apps run alongside, and in sync with each other and the other Mini controllers; an iPad based set-up with two controllers and both apps running in sync - that's a good thing! For laptop or iOS musicians this Novation adds that all-important tactile control vibe. Although the aforementioned Launchkey Mini is particularly cool with Novation's iOS app, we kept gravitating back to the Control, because of the Ableton Live templates, and its perfect layout for Logic's Smart Controls. Nobody will fetishise over these things, but almost everybody could use one. A very handy little object.